Live Practicum: students do a real chart reading with teacher feedback and watch other students complete their practicum. The Science of Light Course (also known as the Jyotiṣa Praveśika Course) is meant for those who want to learn how to read astrology charts in an Eastern Indian tradition. The primary goal of level 1 is to help students turn the large amount of astrological information into practical knowledge and be able to begin reading charts. In this way, we present multiple teachings on the same subject to ensure the information is heard more than once and really gets integrated in a way that it can be utilized. It is suggested to first read the chapter, then watch the video. After that, you can re-listen to the audios while you are driving or doing other activities so that you can get the specifics you might have missed the first time through. There are two main recordings (from different years). Often people like to listen to the information again after going through the entire course. You will be reading charts after the course, and therefore listening from a new place. With this in mind, all this is offered with each class. Weekly meetings are intended to discuss material, answer questions, and apply techniques in a way that ensures students properly understand them (students are required to come prepared- having read and listened to the particular topic before class). The course requires 5-10 hours a week and lasts approximately 9 months. For students who have completed the course and paid in full, the recordings will remain available, including access to new material that is uploaded in consecutive years. Completed students are also welcome to join in on future classes of their completed level and associated future study groups. Students are responsible to stay on schedule and finish the program within a 1 year period. Practicum is repeated until it is passed. There is no additional fee if practicum is completed within one year. For those that can’t finish the course material or practicum in 1 year, there is an additional $2oo fee to complete the course and to have Freedom guide them in the final practicum. Tuition Cost: $1400 (if paid in full by course start), [$1200 early registration, if paid by March 1st]. Payment plan option is 4 payments of $400= $1600. First payment starts the course and then a payment is due at the end of chapter 4, 8 and 12 which are more than a month apart. Freedom Cole has taught Vedic astrology to beginners for many years and has developed an effective format. Each lesson in the course goes with a chapter from his book, Science of Light (SOL). 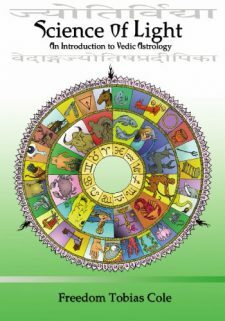 The book is based on an ancient astrological text, and it is geared to give the student a traditional understanding of Vedic Astrology and to link the individual with the ancient texts of the sages of India. The first class/video is the first chapter of the book. The first chapter gives a general overview of the entire system and how it works. Then each chapter/class has a focus of its own, going deep into the various parts of the astrological system. Each builds on the other and nothing is random (though it may seem that way for a beginner). The final chapters bring everything together for the practical application of reading a chart. This video is the free introductory class that Freedom gives the night before the course begins. He discusses who he is, his teachers and the tradition. The course material is discussed and a small lesson is given about calculating the time of Moonrise (from the end of chapter one). After logging in and paying the fees, one can begin watching the classes. Freedom’s assistant will arrange a meeting with you to discuss your goals with the course. Each year, Freedom and assistant advanced students will take a group through the level one course together. Those who purchase the course can begin studying the material any time and then can also join the group when everyone goes through the material together. Presently, course one meets Thursday nights 6-8pm Pacific Time, and course two meets Wednesday 6-8pm Pacific Time. The 2010 audio files are not that good, but it repeats the information with some variation to allow listening a 2nd or 3rd time to be more interesting. There are online recordings from various years past from 2006 to 2019. Many people find they need to listen to the SOL Course 1 more than once. I advise listening to the whole course all the way through and doing the assignments as they are given. The final chapter on reading a chart shows all the areas that need deeper study and development. Then one can listen to the course a second time from a new perspective. Audio recordings are good for the second time through. There are many levels within each lesson and a student will get a different perspective each time. This has been the best method for many students in the past.